You may change the contents of these types of groups at any time while the system is running without interrupting existing traffic. Objects that reference the group will use the updated version for subsequent queries they perform against it. Network security policy: may be configured to drop any clients coming from a blacklist of IP addresses. Rather than maintain a long list within the policy, Avi Vantage maintains the rule logic of that policy separately from the list of addresses, which are kept in the IP group. A user can be granted a role that allows them to update the list of IP addresses without being able to change the policy itself. Logs: classify clients by their IP address and match them against an included geographic country location database. You may override this database by using an IP group to create specific mappings such as internal IP addresses. For instance, LA_Office may contain 10.1.0.0/16, while NY_Office contains 10.2.0.0/16. Logs will show these clients as originating from these locations. Logs searches may also be performed on the group name such as LA_Office. Name: Name of the IP group. IP Address or Ranges: Number of IP address, networks, or address ranges. Country Code or EPG: Any configured country codes or end point groups are listed. The Create IP Group and Edit IP Group popups share the same interface. Name: Enter a unique name for the IP group. Upload File: Click the Upload File button on the right to navigate to and upload a comma separated value (CSV) file that contains any combination of IP addresses, range, and/or masks. Select by Country Code or EPG: Select one or more countries, or type the country name into the search field to filter. Countries may not be combined within an IP group with individual IP addresses. An IP group that contains countries may also not be used as a list of servers for pool membership.For cloud environments set up for Cisco ACI, end point groups are shown. EPGs are IP addresses or groups configured within the Cisco APIC controller and automatically imported into Avi Vantage. String groups contain arbitrary lists of comma-separated text that may consist of HTTP URIs, names, or other content to be filtered against for many purposes such as black or white lists. An HTTP security policy may use a string group to filter allowed HTTP URIs. An HTTP application profile may use a string group to identify mobile users to ensure they receive more aggressively compressed HTML files. Name: Name of the string group. Number of Strings: Number of strings within a string group. 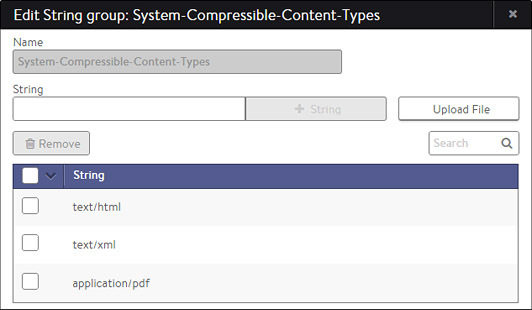 The Create String Group and Edit String Group popups share the same interface. Name: Enter a unique name for the String Group in the Name field. String: Enter any text in the field, and then click the + String button to add. Upload File: Click the Upload File button on the right to navigate to and upload a comma separated value (CSV) file that contains text. This article will be updated with more information on this feature.